For some reason that I can't remember—it probably just popped into my head—I did a Google search for information on using my DSLR with a telescope on February 2nd, 2011. 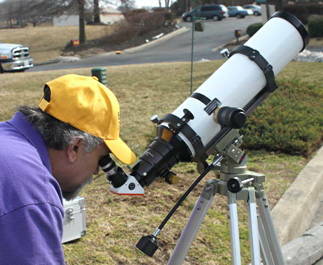 When I got to the Meade site I saw the link to "Coronado Solar Telescopes & Filters." That began three weeks of searching for info on solar 'scopes. Why solar? Well, I spent years of my life as a vampire. I finally got back onto a daylight schedule. I'm not up at night and there's really only one thing to look at. Based on my research, I came to the conclusion that Lunt had an edge on Coronado, particularly in regards to photography. I searched for the nearest Meade dealer and found Hands On Optics in Damascus, Maryland. I talked to Joe on the phone and he agreed with what I had already decided after a couple of weeks of reading: given my budget and needs the Lunt LS60Tha-B1200-FT was the glass slipper. A couple of weeks later I took a trip up to the store. Joe brought his personal telescope (the same model but with pressure tuning) to work so I could see what there was to see. It was a bit hazy but there were prominences and filaments plainly visible. That clenched it. Unfortunately I wasn't able to get a decent afocal picture. My new telescope order is sitting in the queue at Lunt as I type this. In a couple of months (hopefully) it will be here. I also ordered the solar finder and dovetail. As for the tripod, I had originally planned on buying a Meade DS-2000 but Joe talked me into a Celestron CG-5 instead. So much for my budget. But after observing with his personal telescope I had a feeling I'd need something stiffer because of all the trouble I had seeing something in the eyepiece. The problem is that I'm extremely nearsighted. My glasses are about -16.00/-3.75 diopters (both lenses). Even with the highest index resin available today (I can't remember precisely but I think they're Seiko's 1.74) the distance between my cornea and the front surface of the lens is almost 20mm! I had to take my glasses off and substantially refocus to actually see the entire disc. Even then I was seeing reflections on the surface of the eyepiece. Obviously I'm going to need some sort of hood. Photography may be less of a problem than picking a suitable eyepiece. Why start yet another blog?